A school of Longfin Tiger Barbs makes a very lively and playful display! The Longfin Tiger Barb is one of the most attractive varieties of the Tiger Barb Puntius tetrazona. Like its predecessor, it has a very striking coloration. The body is brightly colored with four very distinctive black stripes on a yellow-to-red background. The biggest difference between this fish and its parentage is that the Longfin Tiger Barb has longer fins. When mature, their colors will tend to fade a bit, but they retain the long, elegant fins. Keep a school of these attractive fish in a nice-sized aquarium to create a lively, interesting display. This long-fin variety makes a very good fish for the beginner and is enjoyed by advanced aquarists as well. Their aquarium needs, care, and feeding are the same as their parentage. They are quite hardy as long as their water is kept clean with regular water changes. These lively, active fish need plenty of room to swim. The aquarium can be planted around the sides and back but leave lots of open swimming area in the middle. Tiger Barbs are generally playful but can be nippy with tankmates. These very active, fast-swimming fish do best kept in a school of at least 6 or 7 fish. Within the school, they will establish a "pecking order." They demonstrate a tendency to nip other fish mostly when they are kept individually or in a smaller group. Kept singly, they can become aggressive. They will do very well in a community tank with other active species. A larger school of these barbs will be kept busy chasing each other rather than bothering other tankmates. Still, they should not be kept with slow-swimming or long-finned fishes such as gouramis and angelfish. Try making a mixed school by combining these fish with regular Tiger Barbs and other varieties to create a very attractive effect in the aquarium. Other varieties you can add are the Green Tiger Barb and the Albino Tiger Barb varieties, which include some wonderful red, gold, and platinum strains as well. Mixing more varieties works equally well and creates a really exciting effect with a nice contrast of swift moving, darting color. 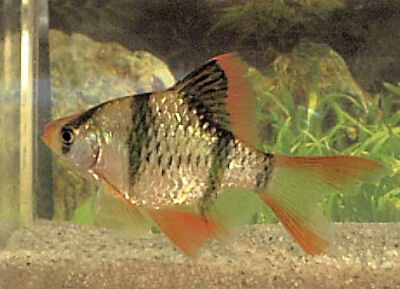 The Tiger Barb Puntius tetrazona (previously Barbus tetrazona) was described by Bleeker in 1855. They are found throughout the Malay Peninsula, Sumatra, Borneo, and possibly Thailand and Cambodia. They are native to the island of Borneo and found in both the Malaysian state of Sarawak and Kalimantan, the Indonesian part of the island. Feral populations have been introduced to Singapore, Australia, the United States, and Colombia. These fish show a preference for quiet forest streams and tributaries with clear, highly oxygenated waters. The substrate is normally composed of sand and rocks and grows very dense vegetation. In nature, this fish feeds on insects, diatoms, algae, small invertebrates, and detritus. The Longfin Tiger Barb is a captive-bred variety developed from the Tiger Barb. Many of these barbs are captive-bred for the aquarium industry. There are no wild populations of these strains. IUCN Red List: NE - Not Evaluated or not listed - There are no wild populations of this variety. The Longfin Tiger Barb has a deep, round body with a high back and a pointed head. It has been selectively bred for fins that are longer than those found on the regular Tiger Barb. These small fish reach lengths of only up to about 2 3/4 inches (7 cm) in nature, though they are generally a bit smaller in the aquarium. They have a lifespan of 6 to 7 years with proper care. The body is gaily colored with a yellow to red background and four very distinctive black stripes. The dorsal, tail, and ventral vins are edged with red. When in spawning mode, they have a bright red snout. The Longfin Tiger Barb is a very hardy fish, great for both beginning and experienced aquarists. They are usually not very picky eaters and will thrive on quality flake foods. As with any selectively-bred fish, they can be a bit weaker than the fish they originate from. Their tank needs to be kept clean as they are susceptible to ich. With clean, clear, well-filtered water, these fish will do very well. Use caution when selecting tankmates, however, as these barbs will nip the fins of slow-swimming and other long-finned fish. Since they are omnivorous, they will generally eat all kinds of live, fresh, and flake foods. To keep a good balance, give them a high quality flake food every day. Feed brine shrimp (either live or frozen) or blood worms as a treat. This fish will eat as much as you feed them. The rule of thumb when offering food several times a day is to offer only what they can consume in 3 minutes or less at each feeding. When offering food just once a day, provide what they can eat in about 5 minutes. Longfin Tiger Barbs are not exceptionally difficult to care for provided their water is kept clean. Aquariums are closed systems, and regardless of size, all need some maintenance. Over time, decomposing organic matter, nitrates, and phosphate build up and water hardness increases due to evaporation. Replace 25 to 50% of the tank water at least once a month. If the tank is densely stocked, 20 to 25% should be replaced weekly or every other week. The Longfin Tiger Barb will swim in all parts of the tank but prefers open areas in the middle. Since their maximum size is less than 3 inches, a school will need at least a 15-gallon aquarium. However, because they are very active swimmers, they will do much better in a tank that is 30 inches long and 30 gallons or more. Provide good filtration, do regular water changes, and keep the tank covered as these fish may jump. These fish will do best and be most effectively displayed in tanks that simulate their natural habitat. An aquarium best suited to this fish has a fine gravel bottom with plants around the inside perimeter along the sides and back, leaving lots of open swimming space. Providing drift wood or bog wood will also help them feel at home. An efficient filter and good water movement are needed for the male fishes to develop their coloration. Breeding Temperature: - Breeding temperatures between 74 and 79° F (24 - 26° C). Range ph: 6.5-7.5 - Hobbyists intending to breed their stock should keep the water slightly acidic (to 6.5). Water Region: All - These fish will swim in all areas, but they prefer the middle of the aquarium. The lively Longfin Tiger Barb makes a good community fish, especially with other fast-moving fish. However, they have been known to get a bit nippy, especially when kept singly or in very small groups. They have a tendency to nip the fins of slow-moving and long-finned fishes, such as gouramis and angelfish. A singly kept fish will be highly aggressive. Groups of this fish will be hierarchical, so keep them in a school of at least 6 or 7 to diffuse some of their aggressive tendencies. This can help prevent them from bullying other fish. In schools, they bother each other instead of other tank inhabitants. Watch for damage to their long fins due to nipping. Temperament: Semi-aggressive - They are good community fish when kept in groups and when other tankmates are also fast moving fish. A singly kept fish will be highly aggressive. Same species - conspecifics: Yes - These fish should be kept in large groups of at least 6 or 7, and more are better. Peaceful fish (): Monitor - These fish may irritate peaceful tankmates with their constant activity and possible fin-nipping. Slow Swimmers & Eaters (): Monitor - This is a rather quick fish at feeding time. Make sure any slower fish get enough to eat if you are keeping them with barbs. The female is heavier, especially during spawning season. The males are more brightly colored and smaller. During spawning, they develop a very red nose. The Longfin Tiger Barb was developed from the Tiger Barb, which is moderately easy to breed, and raising the fry is relatively simple. They become sexually mature at about 6 to 7 weeks when they have attained a size between about 3/4 of an inch to just over an inch in length (2 - 3 cm). Select breeding pairs from the school that have excellent markings and strong color. These barbs are egg layers that scatter their eggs rather than using a specific breeding site. The eggs are adhesive and will fall to the substrate. These fish can spawn in a 20-gallon breeding tank set up with a sponge filter, a heater, and some plants. Use marbles as a substrate to help protect the eggs. The water should be a medium hardness to 10° dGH, slightly acidic with a pH of about 6.5, and a temperature between 74 and 79° F (24 - 26° C). 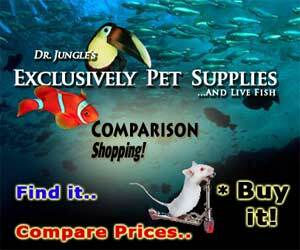 Condition the pair with a variety of live foods, such as brine shrimp. Introduce the female to the breeding tank first, and add the male after a couple of days when the female is full of eggs. The courting ritual will start in the late afternoon with them swimming around each other. The male will perform headstands and spread his fins to excite the female. The spawn will take place in the morning, with the male chasing and nipping the female. The female will begin releasing 1 to 3 eggs at a time. Up to 300 eggs will be released, though more mature females can hold 700 or more. After the spawn, remove the parents as they will eat the eggs. The eggs will hatch in about 48 hours, and the fry will be free-swimming in about 5 days. Fry can be fed infusoria, a liquid fry food, or newly hatched baby brine at least 3 times a day. Pay close attention when feeding as uneaten foods can quickly foul the water. The fry will require clean water to survive. See the description of breeding techniques in Breeding Freshwater Fish: Barbs. Also, see Fish Food for Fry for information about types of foods for raising the young. Longfin Tiger Barbs are hardy, and disease is not usually a problem in a well-maintained aquarium. They are primarily susceptible to Ich if good water quality is not provided. Remember that anything you add to your tank can introduce disease. Not only other fish but plants, substrate, and decorations can harbor bacteria. Take great care and make sure to properly clean or quarantine anything that you add to an established tank so as not to upset the balance. These fish are very resilient, but aquarists should still read up on common tank diseases. Knowing the signs and catching and treating them early makes a huge difference. For information about freshwater fish diseases and illnesses, see Aquarium Fish Diseases and Treatments. The Longfin Tiger Barb is not as readily available as the regular Tiger Barb or the other color morphs. It is moderately priced and can be found both in stores and online.